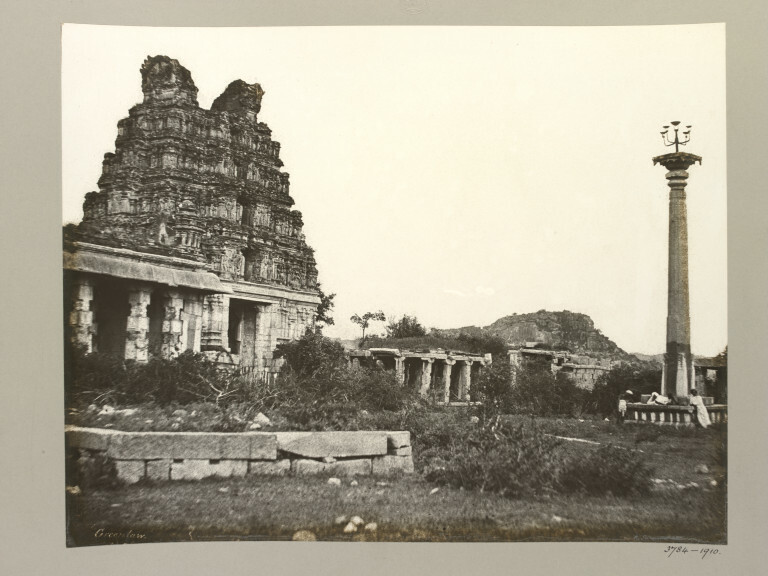 Hampi (Vijayanagar) Bellary District: Eastern Gopura and Lamp Column, Vitthala Temple Complex. This photograph shows an oblique view of a five tiered gopura, or towering gateway, with ornately carved figures, niches and pilasters facing a large stone lamp column to the right. The vaulted roof of the gopura is damaged and missing its central section. The gopura is set into a low colonnaded wall. In the foreground to the left is another structure of one storey with squared columns and a heavy parapet and a low stone platform extending towards the viewpoint. In the far distance is a rocky hilltop. Three figures can be seen, posed presumably for scale, at the base of the lamp column. The sky has been whited out on the negative. Inscription bottom left. The negative is inscribed 'Greenlaw' and this appears in the bottom left hand corner of the photograph. A negative number appears to have been cropped but may exist on the negative for this print. 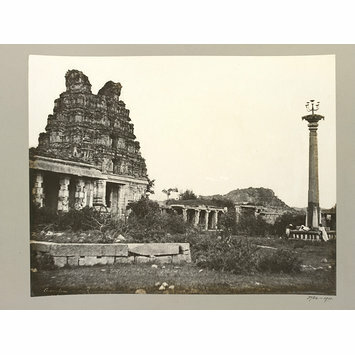 This photograph shows the main entrance, or eastern gopura, to the Vitthala temple complex and the monolithic lamp column which no longer exists except for a stump and the base. For a similar view within the series, see PDP 3785-1910. The photograph is siginificant as a visual record of the extant lamp column before it was reduced to a stump as a safety measure after the base had been badly vandalised by treasure hunters, as such, it is the only known photographic record of these structures, one of which no longer exists. The V&A holds the only known print for this particular photograph (see also 3795-1910).